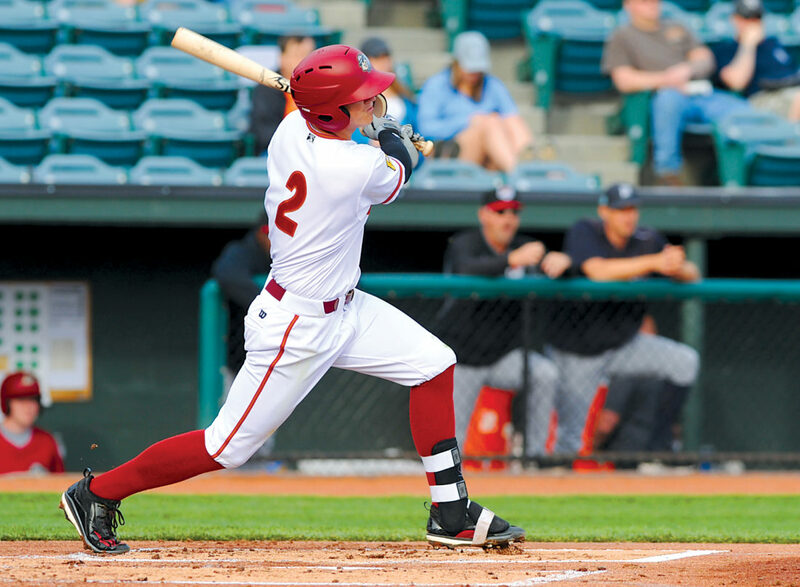 Mirror photo by Gary M. Baranec The Curve’s Kevin Newman swings during a loss to Erie on Monday. Hitters nowadays try to swing up to elevate the ball. Baseball is changing right before our eyes, and will continue to do so, as more and more hitters begin to understand that a once-seemingly dumb idea is now the smart way to go. Hit the ball in the air. Don’t swing down or necessarily even level, as we were all taught when we first picked up a bat, but instead, develop a slightly upward swing that will increase the chances of elevating the ball. If a hitter wanted to do that 20 years ago? “They probably would have laughed at you,” said Curve manager Michael Ryan, who played parts of five seasons in the major leagues. 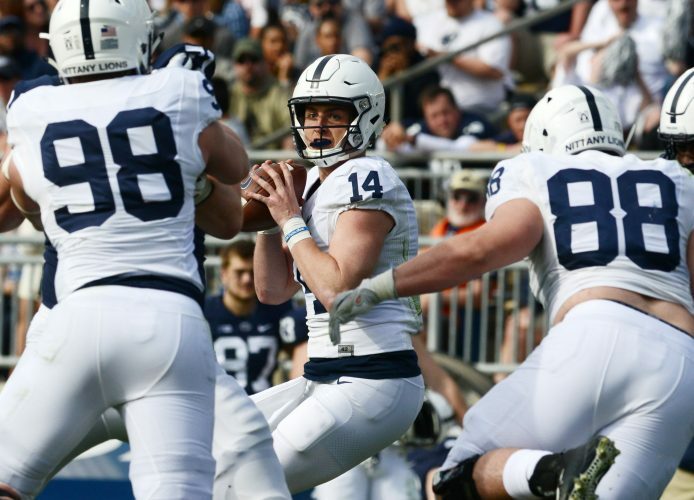 “But the way defense is lined up nowadays and all the defenders playing on one side of the field, if you do hit the ball on the ground, you’re going to be out most of the time. The following statistics are eye popping, and are the basis for the new-age way of thinking about hitting. In the major leagues last season, balls on the ground produced a .239 batting average, compared to a staggering .411 mark for balls hit in the air — line drives or fly balls. Those numbers are from a recent Associated Press story on the subject. Baseball has become increasingly enamored with and, frankly, controlled by an enormous reliance on statistical data. The difference between .411 and .239 is so crazy that it begs the question of why any hitter would ever decide not to swing up on the ball. But old habits die hard, especially for something players have been taught since they were 5 years old. One of the poster boys for the new hitting philosophy is Blue Jays star Josh Donaldson, who’s adamant about not hitting balls on the ground. As the recent AP story pointed out, Toronto’s Jose Bautista and the Cubs’ Kris Bryant also are believers in the strategy and have upward swings to take advantage of it. The trend has begun to make its way to the minor leagues, and again, with such a gigantic disparity in the stats, it’s impossible to believe it won’t become more and more prevalent. Curve second baseman Kevin Kramer said he’s made a slight mechanical change in his swing in order to elevate the ball more. Kramer is a second baseman and not a prototypical power hitter, but it’s easy for him to see the advantages. Coincidence or not, Kramer hit two homers in a game last week for the first time since Little League. He’s 23 years old, and like pretty much everyone who’s ever played the game, he was always dissuaded from hitting the ball in the air. As Ryan noted, “The game has changed because of the extreme shifts.” There’s advanced data to tell defenders exactly where a guy is most likely to hit a ball, and in recent years, more and more teams have taken to dramatic shifts, with the Pirates being one of the forerunners several years ago. Hitters have to do something to shift the balance somewhat back in their favor, and more of them are figuring out that the upward swing can help do just that. Everything in baseball is about percentages, even small ones, so anyone who’s not trying to do everything he can to take advantage of the numbers is only hurting himself. One important thing for any young ballplayer — or parent of a young player — to understand is that the trying to hit the ball in the air more is not something that should be done until higher levels of baseball. Swinging level or down at younger ages does help put the ball in play and cut down on strikeouts, and let’s face it, most kids under the age of 12 aren’t great at fielding hot groundballs. As a player advances into his teenage years and playing high school or legion ball, he has far more experience in the game, so learning how to adapt to more of an upward swing should come easier. “The big thing about it is trying to do that the right way and not dropping the back shoulder and dipping,” Kramer said of the adjustment. It might look cool to take a huge Ken Griffey Jr. uppercut swing, but that’s not for every hitter. A batter’s swing is full of subtle nuances, so elevating the ball the right amount versus hitting a bunch of popups comes down to minor adjustments. “The flight of the ball will let you know if you’re on or not,” Ryan said. “If you’re popping everything up and it’s not leaving the infield, there’s that adjustment you have to make. Maybe you’ll go back to going down through the baseball to maybe even that out a little bit.